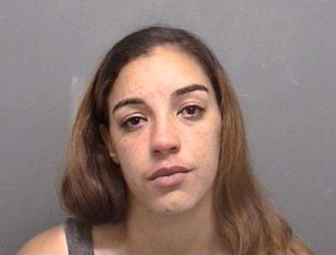 A 24-year-old woman who showed up at TD Bank in Darien with a check for more than $1,600 and a form of identification that made a teller suspicious was arrested on a felony fraud charge, police said. Arrest photo for Emily Ramirez, 24, of 186th Street in the Bronx. Ramirez, who lives on 186th Street in the Bronx, was charged with first-degree forgery (a felony), third-degree identity theft and criminal attempt to commit fourth-degree larceny. The teller said that after Ramirez said she wanted to cash a check, she stood their silently until the teller asked for the check. Ramirez handed it over and also gave the teller a New Jersey identification card with Ramirez’ picture on it (but not with Ramirez’ actual name). The teller later told police that the ID card looked “very strange” to him, although the name and address on it matched what was on the check. The teller took the check and ID to his supervisor to get her opinion. When Ramirez saw them talking, she left the bank. Police were called at 5:34 p.m. By the time they arrived, Ramirez had left the bank, but a woman who fit her description was found across the street, and a bank employee identified her as the woman trying to cash the check. When police questioned Ramirez, she said admitted to trying to make the fraudulent transaction. She told police that a friend had approached her about an opportunity for “making some money” by cashing a fake check. The friend introduced her to two males (she refused to give their names to police). The two got her the ID and check to use — both of which belonged to an actual person. Ramirez was initially held on $20,000 bond and told to appear July 13 in state Superior Court in Stamford. A representative of the bail commissioner’s office later reduced the bond to a promise to appear in court. A woman who tried to fraudulently cash two checks through a drive-up teller window at People's United Bank last week drove off when bank employees became suspicious and asked her to come into the bank, police said. Police gave this description of what happened: At about 11:24 a.m. on Tuesday, Oct. When some hacker got into Chipotle digital records containing customer debit and credit card information, only some of the chain's restaurants were affected, but among them were the two restaurants in Darien, according to the company. Chipotle announced on Friday that the data breach affected certain restaurants at certain times. In its online announcement, the company also provided a search function to show whether its restaurants in particular communities were affected by the breach.